Sometimes it's hard to see the future until it smacks you in the face. For the past two years, Apple has been telling us that Mac OS X is on the horizon, and that when it arrives it'll be a revolutionary development that will change the Macintosh experience forever. But like the year 2000, the arrival of OS X always felt like a distant eventuality. Suddenly, the future is now. Shortly after the calendar clicked over to 2000, Apple unveiled Mac OS X's brand-new interface—named Aqua—giving the world its first glimpse of how we'll all interact with our Macs for years to come. And for all the hand-wringing and online carping about Apple's plans to remake the Mac interface, the changes Mac OS X will bring are more likely to delight than to disappoint. While most Mac users will initially notice the new interface elements Apple is adding in OS X, it's important to note that the most significant changes are happening behind the scenes. There, you'll find that Mac OS X is a fully modern operating system, with features such as preemptive multitasking and protected memory to make the hearts of computer geeks go pitty-pat. You may not care about those buzzwords, but you will care about how the technology behind them will improve your Mac experience. The first question most Mac users will have about Mac OS X is a simple one: When is it arriving? Over the past two years, the planned release dates for this new operating system have continued to change, but now Apple has clearly outlined how Mac OS X will spread from the design labs at Apple to the world at large. During the latter part of 2000, Mac OS X will likely be included with new Mac models as they're introduced; this period will culminate in the final date on Apple's OS X roll-out calendar, January 2001. The company says that after that point all new Macs will ship with Mac OS X, not Mac OS 9, on their hard drives. So whether you're planning on buying OS X this summer, or waiting until you buy a new Mac next year, chances are that sooner or later you'll be using Mac OS X. 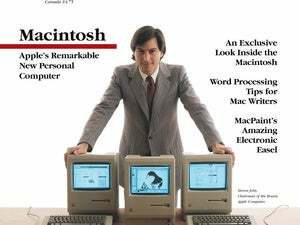 While the Aqua interface represents a major evolutionary step away from the current Mac interface?a step that adds flair to the on-screen experience, matching Apple's striking external designs?OS X is still recognizably Macintosh. The Mac menu bar remains intact along the top of the screen (although there's now a Go menu alongside File, Edit, View, and Special), and at first glance most windows look like traditional Mac windows. But if you give Aqua a closer examination, you'll discover a host of artistic touches that elevate this new interface above its predecessors. That's not to disparage the current Mac interface; today's technology allows Apple to make enhancements that simply couldn't be included before now. Widgets The first thing you notice when you look at Aqua is, of course, the color: silver with blue highlights. Most colored items have a shiny, 3-D appearance that makes them look as if they're made of polished glass. Aqua's blue progress bar undulates as it moves from left to right across the screen. Brightly colored sliders stand out against windows' silver backgrounds. Even scroll bars look like fragile blue-glass objects. In the current Mac interface, buttons that can be pushed by pressing the return key stand out because they have a thick line drawn around them. Most longtime Mac users have figured this out, but it's an interface convention lost on many novice users. In Mac OS X, you can't miss the default button?it's blue, and it throbs brighter and darker while waiting for your command. Windows At the top left corner of every window are three brightly colored circles (red, yellow, and green) that Apple says were designed to evoke a traffic light. These buttons let you control what happens to the active window. When you move your mouse over them, they reveal their functions. The leftmost circle (red) fills with an X, indicating that if you click on it, the window will close—pretty much how the Mac behaves when you click on the top left button today. Next to the red circle is a yellow one, which fills with a minus sign. Click on it and you'll minimize the window, making it disappear from the screen and move to Mac OS X's new Dock area at the bottom of the screen (more on the Dock follows). Clicking on the green button, which fills with a plus sign, maximizes the window, expanding it to fill the screen. These circles also help you keep track of which window is active. They're filled with color only when they're in the frontmost window; if a window isn't currently active, the circles are transparent. Each window's top right corner contains another button, this one with a dot inside. Clicking on this button leads you into something called Single Window Mode, in which only one window is visible at a time. Whenever you open another window, the currently active window is minimized automatically and sent to the Dock. Shadows and Fog A couple of the new items Apple has added to the Mac's look in OS X might seem frivolous to a no-nonsense user, but these features undoubtedly enhance the look-and-feel of the Macintosh experience. Each window casts a faint shadow on whatever is behind it?and that shadow is partially transparent, making your desktop feel remarkably three-dimensional. Subtle shading is everywhere in the Aqua interface. Every pull-down menu and dialog box is partially transparent, showing a hint of what's behind it. When you let go of your mouse, menus don't simply disappear; they fade away. And all Mac OS X text is anti-aliased, featuring smooth edges that are much easier on the eye than is the old-fashioned jaggy type. The ability to feature hazy shadows, to display smooth-edged type, and to create transparent dialog boxes is pervasive in Mac OS X thanks to Quartz, a new graphics system derived from Adobe's PDF technology. But this new graphics power isn't used just for transparent effects: just about everything you do with your mouse in Mac OS X has an immediate response. If you drag a window around, the entire contents of that window move. That doesn't sound like much, but keep in mind that when you move a window in the current Mac OS, all you really move is a gray outline of that window. The actual window only moves once you've released your mouse button. Similarly, when you resize a window, you actually see the size of the window change as you're dragging. Finder Ever since Apple previewed a version of Mac OS X that used a completely different Finder interface, Mac users have fretted about the future of the Mac's venerable file browser. Those concerns weren't baseless. Mac OS X does indeed offer a very different sort of Finder, one that will undoubtedly appeal to many Mac users and repel others. But it also provides all the functionality of the old Finder. And that means that those who prefer today's method of finding and copying files will be able to continue using their Mac more or less as they have. The new Finder's window has a row of buttons at the top, reminiscent of Mac OS 9's Sherlock 2 interface. If you click on one of these buttons, you'll be taken to a specific location on your Mac: the Computer button shows available drives and your network connection; Home takes you to your home folder (especially important if your Mac is used by several different people); Apps leads you to the home of all your programs; Docs to where you store your documents; Favorites to a collection of commonly visited parts of your Mac; and People to the folders of all the people with whom you share your Mac. Next to these buttons is a View button, which lets you switch among three different ways of viewing the contents of a Finder window: List, Icon, and Browser. The List and Icon views are basically the same sorts of view your Finder has today; the Browser view is a multicolumn window that lets you view several levels of a hard drive at once. When you click on a folder in a column list, the contents of that folder are displayed in the next column to the right. If you click on a file, the Finder will try to display a preview of what's in that file?a fast way of seeing if that JPEG image on your disk is the photograph you think it is. Below the row of large buttons is a blue "back" button that functions just like its equivalent in a Web browser: it lets you go back to where you've just been. Next to it is a pop-up menu that displays your current location; if you click on it, it displays other locations you've viewed recently. The Dock Perhaps the most radical addition to the Mac OS interface in Mac OS X is the Dock, a strip that lives at the bottom of your screen and displays the contents of open windows (you can even opt to have it appear only when you move the cursor to the bottom of the screen, like the Windows task bar). The Dock can contain anything you want: Not just images representing minimized windows but also items you drag into it. That means folders, applications, documents, even links to Web sites. Each item stored in the Dock has its own icon, which can be a thumbnail view of the contents of that item. Applications can also use a Dock icon to show information about the status of a window?for example, a mail program's Dock icon could appear differently if you had new mail waiting. Clicking on an item in the Dock automatically opens its window in your workspace. Mac OS X's interface refinements will undoubtedly make the Mac more elegant than ever. But what's going on under the hood in Mac OS X will make this operating system more powerful, stable, and adaptable than Mac OS 9. Here's a peek at some important improvements. Speed and Stability Ever had one of your programs bomb and crash your computer? Of course you have. But Mac OS X offers protected memory, meaning that OS X ropes every program off in its own space, where a misbehaving program can't harm any other programs. And you've undoubtedly noticed that sometimes your Mac really slows down when you've got multiple programs running, especially if they're trying to perform a task such as downloading a file from the Internet. That's because right now, every running program gets to take as much processor power as it needs. Here, too, Mac OS X plays traffic cop: The operating system itself determines how much processing time individual programs get. As a result, the program you're currently using is much less likely to bog down just because some other program is churning away. Powerful Graphics Graphics and publishing pros have depended on Adobe's PostScript technology since the dawn of desktop publishing. Those same people will cheer Mac OS X's new graphics engine, called Quartz, which is based on Adobe's Portable Document Format (PDF). Quartz also includes powerful compositing features—such as the transparency effects used in the new Aqua interface design—which will undoubtedly be put to use by high-end graphic design programs. Gamers will be pleased by the performance of OpenGL, a 3-D-graphics standard that enjoys wide support throughout the computer industry. OpenGL is tightly integrated with Mac OS X; this should make Macs mind-bogglingly awesome game machines. Compatibility Mac OS X includes new features that let you run your old Mac applications without a hitch. In order to retain compatibility with old software, without sacrificing powerful new features, Mac OS X supports four very different program styles, each with its own strengths and weaknesses. If you're running an old program that hasn't been updated for Mac OS X, that program runs in what's called the Classic environment. These programs can't take advantage of memory protection or preemptive multitasking. As a result, if one of these programs crashes, all the other programs running in Classic may as well. Developers writing programs for Mac OS X from scratch could use Carbon, but they might instead use Cocoa, a system that Apple claims is easy to use to write software but will not run on OS 9. Finally, it's important to note that underneath Mac OS X is something called Darwin—essentially a version of the Unix operating system. That means Mac OS X should also be able to run programs written for Unix operating systems, including Linux. While most Mac users will not avail themselves of this opportunity, it will appeal to many power users and Unix heads, who can get the ease of use of the Mac and the power of Unix in a single operating system: Mac OS X. Just as Apple's distinctive hardware designs set the Macintosh free from the beige-box syndrome that plagues the rest of the computer industry, Mac OS X's bold new interface stands to do the same for Mac software. But Mac OS X is much more than a fresh coat of paint on the Mac's user interface and much more than a typical operating-system update. During the next year, the new Aqua interface and the technology behind it will begin to change the ways we experience our Macs. It will take time for these changes to catch on, and only time will tell how favorably?or how quickly?the industry will respond. For now, however, the future looks very, very good. Macworld.com Editor Jason Snell has reported on Mac OS X since it was first announced.